Extendable glass dining tables are super practical and super fashionable. They will really come in handy if you want to have a beautiful dining table for your family or a group of visitors. The glass makes it modern and makes sure that you’ll see every piece of dirt so you can clean the dining table real easy. The extendable part makes it handy if you’re expecting a large group of people to come over. If you’re looking for extendable glass dining tables look no further, we’ve done hours and hours of researching the best extendable glass dining tables just so we can help you to make a good choice when buying them. Set the mood for the perfect dining experience with the CasaBianca Furniture Frosty Collection Glass Extendable Dining Table. The legs are made out of chrome metal, a quality that’ll last a lifetime. The clean, modern lines add a sophisticated look that easily complements any home design and adds a modern edge to any room. It is perfect for 6 people or even more. Super easy to extend, the perfect addition for a beautiful home. The Chintaly Imports Pop-up Extension Glass Dining Table is a more affordable dining table. It is imported out of China but make no mistake it is still made out of durable steel and has a clear tempered glass top. You have to try really hard to make any scratches to the glass because they are almost non-existent. Perfect for 6 or more people and really affordable if you’re looking for a cheaper design but still want some good quality. 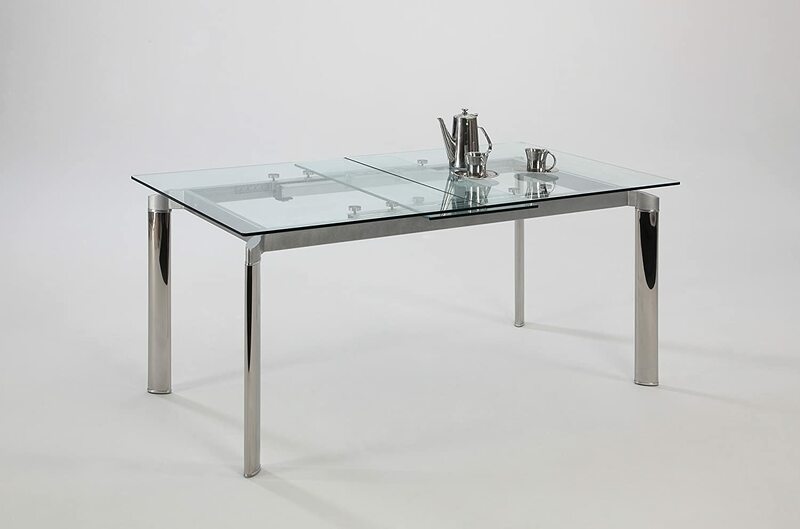 The Creative Furniture Stark Extendable Dining Table features a sharp looking profile made possible by its mixture of 15 mm clear tempered glass, chromed stainless steel supports and its x-ray like design, showing off its flashy frame. Smooth operating extensions pull out on either end of the table and retract back underneath with ease. It’s not that hard to assemble, it’ll take less than an hour and is one of the most beautiful dining tables that we have reviewed. The manufacturers created a really nice design and they recommend Fabio chairs to complete the set. 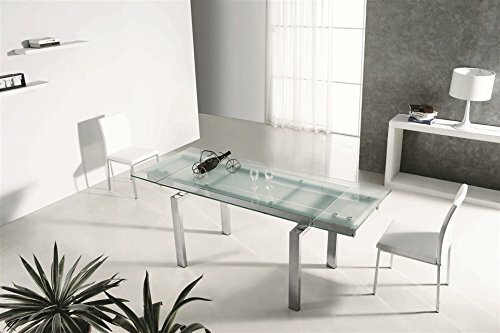 They Casabianca Furniture Thao Collection Glass Extendable Dining Table is the perfect addition if you’re looking for a smaller dining table which you can still extend to have some more people at your table. The Casabianca Furniture Diamond Collection Polished Extendable Dining Table is perfect if you just want to have an have-it-all dining table. It is one of the more expensive ones but you really get what you pay for. It’s made out of Stainless Steel/Glass that’ll last almost forever. This table is perfect for 6 or more people but you can even have more people sitting at this table. It’s part of the Diamond Collection and the name says it all. Who doesn’t want to have something from the Diamond Collection! 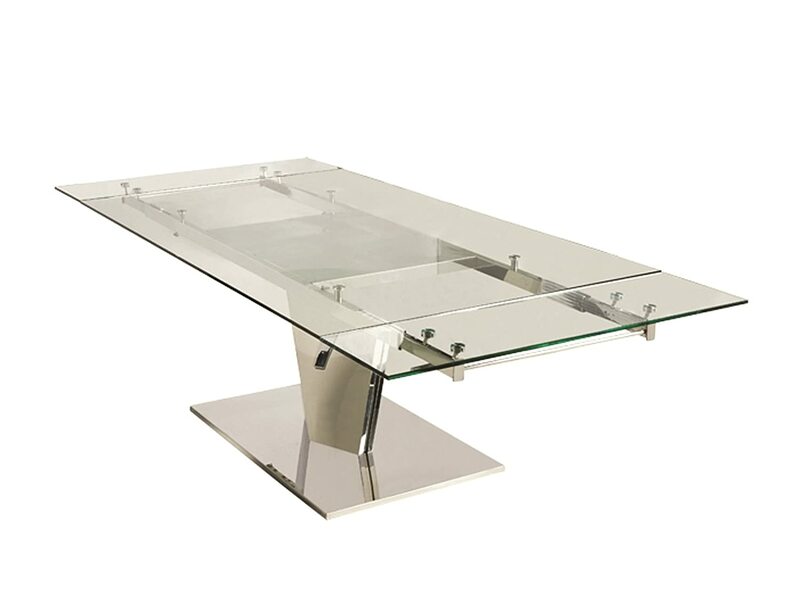 Extendable glass dining tables are known for two things: the top glass and the extendable part. We’ll provide you with a little bit more detail about these dining tables and why they are a good addition to your home. A lot of people have glass dining tables it works well with many decor themes. It has a reflective surface, it is an excellent choice for a space that might need to look a little lighter and brighter. Because of the glass, you can see everything that is happening underneath the table. Today’s versions are made with tempered safety glass, which means the glass resists scratches and heat and won’t shatter if knocked. A good extendable dining table comes super in handy when the occasion calls for accommodating extra guests. Some people don’t like to have a really large dining table in their room. But when they have some extra guests they don’t have enough room to accommodate them all. So it’s a small dilemma. That’s why extendable dining tables exist, for this kind of occasions. 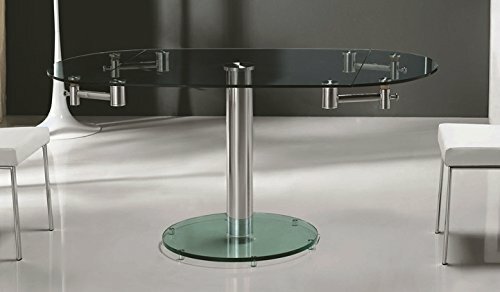 Buying an extendable glass dining table is not as easy as it looks. Most of the times it is a little bit more expensive than a regular dining table so you want to spend your money wisely. When you are buying a glass dining table always check the quality of the glass. You don’t want it to shatter everywhere when you accidentally place something heavy upon it. You also certainly don’t want to create any scratches on them especially when you are using knives and forks. People who have an extendable dining table know that they need to make sure that it has a good locking mechanism, so it is steady when you’re eating on it. You don’t want your guest to spill any soup on the table just because you didn’t want to spend an extra few dollars to make sure that the table is steady when extended. 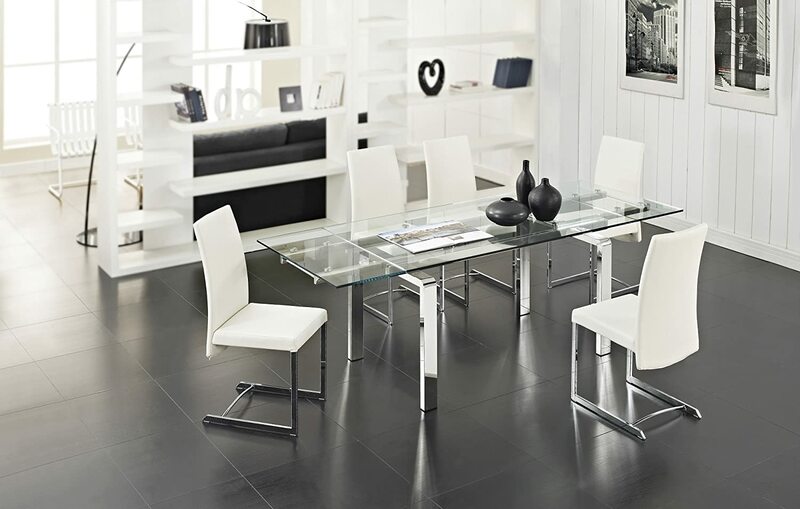 Extendable glass dining tables are a really good addition to your home. They are beautiful and come really in handy when you have to accommodate extra guests. Just make sure to keep the tips above in mind when buying them as it is an expensive addition but an addition that you want to last a lifetime.